China is fast refurbishing its arsenal of silo-based long-range ballistic missiles to carry multiple independently targetable warheads, defense experts say. The move comes decades after Beijing acquired the technology, indicating a strategy change. It has been speculated on for years that the Chinese military is upgrading some of its bigger ICBMs with Multiple Independently-targeted Reentry Vehicle technology (MIRV), which allows a single missile to carry multiple warhead across the globe and deploy them to aim at individual targets. According to The New York Times, as many as half of China’s 20 DF-5 missiles may have been upgraded by now. With a conservative estimate that each missile would carry three individual warheads, it increased the number of warheads that Beijing may fire at an enemy to 40, up from 20, the newspaper said, citing a number of defense experts. “China’s little force is slowly getting a little bigger, and its limited capabilities are slowly getting a little better,” Hans M. Kristensen, director of the Nuclear Information Project at the Federation of American Scientists, told NYT. In an earlier report on the development, Kristensen said China is probably upgrading its arsenal in response to the buildup of the global antiballistic missile system by the US. Washington says it needs the system to protect itself and its allies from an attack by nations such as Iran and North Korea. But strategists in Moscow and Beijing see it as threat to the national security of their respective countries. “If so, how ironic that the US missile defense system – intended to reduce the threat to the United States – instead would seem to have increased the threat by triggering development of MIRV on Chinese ballistic missiles that could destroy more US cities in a potential war,” Kristensen said. The Pentagon report says China is developing a number of technologies to penetrate antimissile shields. “China is working on a range of technologies to attempt to counter US and other countries’ ballistic missile defense systems, including maneuverable reentry vehicles (MaRV), MIRVs, decoys, chaff, jamming, and thermal shielding,” it said. 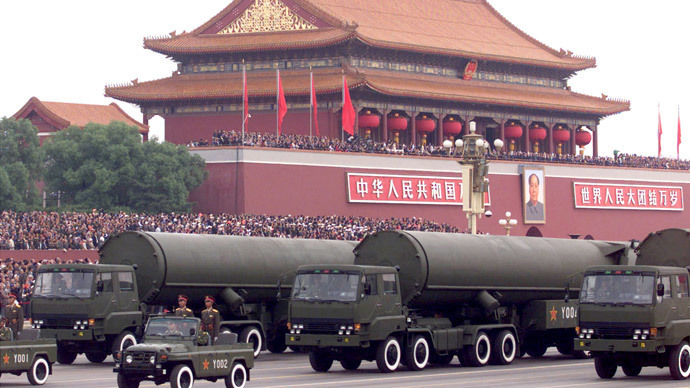 China reportedly had technology needed to miniaturize nuclear warheads enough to fit several of them on a missile for decades, but chose not to upgrade its arsenal. Beijing’s nuclear deterrence strategy is to have just enough weapons that they could survive a nuclear attack and deliver monumental damage to the aggressor. The beef-up of China’s small but punchy nuclear arsenal may trigger similar efforts from other nuclear powers in the region - India and Pakistan. So far only the US, Russia, Britain and France have deployed MIRVed ICBMs. Moscow indicated it may see fit to stockpile more nuclear weapons depending on US foreign policies. The warning came from Mikhail Ulyanov, chief of the non-proliferation department in the Russian foreign ministry, who is attending a UN conference on the Nuclear Non-Proliferation Treaty. The Russian diplomat was speaking about the New-START nuclear reduction treaty signed by the US and Russia in 2010, saying Moscow is sticking to its commitments, but would not go any further due to US behavior. “The things the Americans are doing objectively hampers if not completely eliminates any prospect of further nuclear disarmament,” Ulyanov said. “As of now there are no factors that would make our continued participation in the [New START] treaty counter to Russia’s interest, but hypothetically such a situation may arise from US actions, which we would not want to see,” he added. The US and Russia have parity in nuclear weapons, but America has far more conventional forces. With Russia relying on its nuclear arsenal to safeguard it from a massive US attack, the development of the US anti-missile system is viewed as a dangerous threat to national security in Moscow.